Hello and Happy Father's Day! 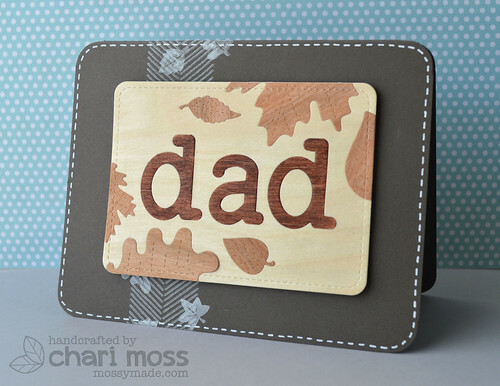 Today I would like to share the card I made for my Dad for Father's Day. 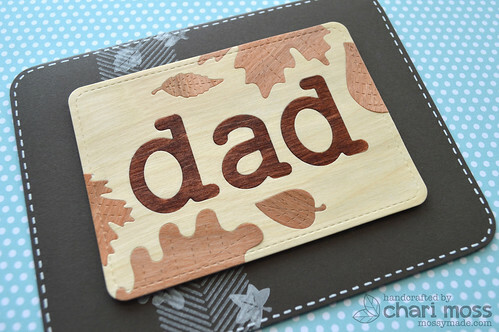 I used dies and wood paper to create this awesome inlaid wood design for my card…I think Dad really liked it too. I first die cut the letters using Louie's ABCs dies from Wood Paper then I laid out my leaf dies around it like I wanted and ran it back through my cuttlebug. I cut the Stitched Leaves out of a darker wood veneer paper as well and then inlaid them back into the openings, you could also color the wood with markers. After securing the leaves on the backside with some post it note tape I lined up the 3x4 stitched journaling card die around my design and then cut out the whole panel. I only had 2 colors of wood paper so for the letters I simply colored the cut outs with a darker brown copic and then inlaid those pieces back into their openings. I cut another journaling card out of white card stock to adhere to the back of my wood to hold all the pieces in there together. I mounted the panel on foam adhesive on Candy Bar card stock from Bazzill and I used Wedding Dress Memento Luxe ink to stamp my images on the card base. Wow! This is incredibly beautiful...well designed and executed. Impressive. Such a beautiful and elegant card! I love your design!